When I take on a commission to write something new, the creative spark usually comes easy enough. Sitting down and putting those tiny dots on paper doesn’t come difficult either. It is the interval between those two phases that most often takes up considerable time! The ignition to write a concert piece for the trombone happened in Copenhagen at the Tivoli Gardens concert hall in 1997. Attending rehearsals of my Hans Christian Andersen Suite for Wind Orchestra, I happened to be around for the rehearsal of Johan de Meij’s inspiring T-Bone Concerto performed by the phenomenal Jesper Juul Sørensen. I was particularly struck by the merging of technical virtuosity and lyrical expression – and, first and last, how completely easy and effortlessly Jesper made it sound. He liked the flavour of my HCA Suite and invited me to compose a concert piece with him in mind. And here we are, some four years and many oeuvres later. 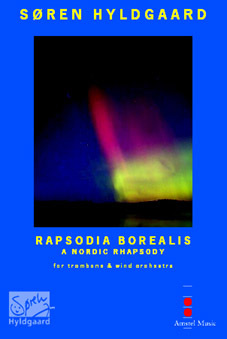 With Rapsodia Borealis I had in mind a sort of circular structure centred around a truly lyrical, cantabile theme – a song of the North for the trombone (hence the title which means Rhapsody of the North). The orchestra is launched at full force but the soloist soon jumps on the carousel of semi-dissonant, kaleidoscopic and nearly minimalist chord progressions. Following a series of playful inventions, the trombone almost surprisingly takes the lead with its tuneful hymn, later to be joined by members of the orchestra in various permutations and arrangements. From the very start, the purpose of this concerto has not necessarily been to re-define the term technically challenging in context with the solo trombone; rather, it was as much my goal to emphasize the tender, lyrical side of the modern concert trombone. 4. Percussion I & II – Gong, Sizzle Cymbal, Snare Drum, Tenor Drum, Whip, Triangle, Wind Chimes, 2 Cymbals. 3. Mallet Percussion I – Xylophone, Vibraphone, Bells. 2. Mallet Percussion II – Marimba, Vibraphone.